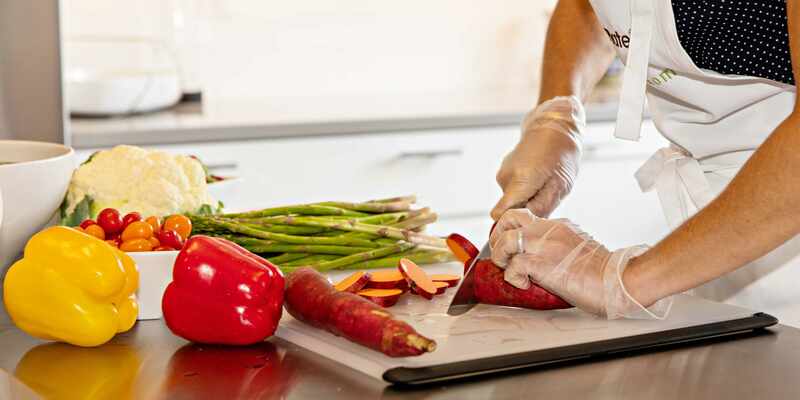 If you’re looking to improve your health and the health of those around you, the best place to start might be in your own kitchen. According to a recent study published in the American Journal of Preventative Medicine, individuals who consumed home-cooked meals versus take-out or prepared meals not only had better quality diets associated with positive health outcomes, but they saved money too! Preparing simple, delicious meals from whole foods does not have to be complicated or expensive. It’s okay if cooking is not your thing. No need to be a Top Chef – a little planning and some basic kitchen tools is all you’ll need. Skillet dinner: Chard, Tomato, and Zucchini Frittata. Breakfast for dinner? Yes, please! Frittatas are an excellent way to incorporate vegetables into a meal. Don’t be afraid to chop up leftover cooked vegetables and add them to the mix. One-pot meal: Slow Cooker Chicken Tikka Masala. With the arrival of the Instant Pot, slow cooking and pressure cooking are making a big comeback and it’s the easiest way to get a complete meal done in one pot. This recipe utilizes canned tomatoes, pantry spices, and canned coconut milk. Instead of fresh ginger, purchase frozen ginger cubes. Sheet pan dinner: Sheet Pan Salmon with Green Beans. Purchasing bagged, pre-snipped green beans saves tons of time here. You don’t even need to halve the tomatoes – simply rinse and scatter cherry tomatoes on pan with salmon. Invest in parchment sheets to save time with clean-up. Fish not your thing? Use chicken instead. Soups and stews: Veggie Loaded Lentil Soup. Perfect timing – almost everyone loves a hearty soup or stew on a chilly day. This recipe uses canned tomatoes, pantry spices, and kitchen staples like carrots, onions, and dried lentils to create a satisfying and nourishing meal.